SAS Institute put a stake in the sand recently with the announcement of its SAS Social Media Analytics service. It’s an important addition to the social media revolution and our ability to utilize the exaflood of data coming at companies from the many new social media sources now enlightening and bedeviling our businesses. In case you didn’t notice, I used the word “service” to describe what SAS is doing, because to call this a software product is a little misleading. The reason that I’m calling SAS’ offering a service and not a product is as much about the nascent nature of the social media world as it is about SAS’ view of what business analytics is all about. And therein lies an important challenge to the market. 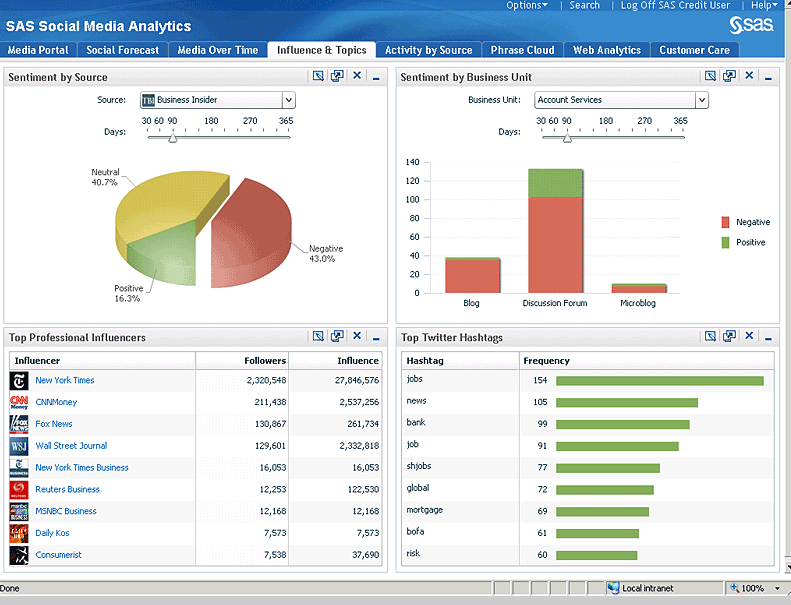 What SAS is offering with Social Media Analytics is an initial consulting engagement followed by a long-term services engagement that will help companies in its target industries – hospitality as an example – sift through the many new and emerging social media sources and provide useable and accurate analysis of what impact social media is having on brand awareness, customer satisfaction, and other key business factors. It will also help companies figure out which social media sites are the ones that are the most relevant, and, here’s the kicker, provide a sense of the accuracy of the analysis that Social Media Analytics provides. That raised a flag for me: it’s one thing to gather data from the social media wild west, and provide analysis of those data. It’s another to say that the data gathered has a measurable, and acceptable, level of accuracy. Think of it from the standpoint of a hospitality company: suppose you look at social data on the quality of a given hotel property and see a huge negative sentiment in the comments, blog posts, and ratings about it. SAS will help you understand why this sentiment is trending south in this way, and how much you should believe the ratings that the software gives you. This accuracy problem is a non-trivial issue: in any largely anonymous data collection and analysis effort, knowing a priori that the data are accurate and reliable is the devil hiding in the details of the analysis. Are people gaming the data – as many have accused Yelp’s followers of doing, some in court? SAS says they can deal with the problem as part of the services they offer. What’s the secret sauce for this miraculous capability? It turns out SAS has gone old school in solving this major new media problem. The accuracy analysis comes first and foremost from the application of brute force – in the form of human analysis – at the time of the initial customer engagement. SAS consultants actually sift through many – ideally many hundreds – of social media “data points” in order to compare their brute force results to the automatic analysis provided by the Social Media Analytics tool. The fact that SAS does this is very much an acknowledgement that the newness of the social media phenomenon and its potential impact on the business is so new that it’s almost more of an art form than a solid practice that can be automated in a black box tool. The fact that this consulting-rich engagement model is also consistent with SAS’ consulting-rich business model is not a coincidence. SAS has an army of talented consultants that drive a huge quantity of the company’s revenue, especially as it relates to tackling the needs of specific vertical industries. How much does this service-as-a-service cost? The good news is not too much, assuming you’re able to deal with six-figure price tags for your social media analysis. Social Media Analytics has a $50K up-front fee, mostly to get the data sources and metrics established, and then a variable fee of $5K to $15K per month to keep the service rolling. It’s not cheap, but then if you take a SAS customer like Marriott, which is driving $6 billion in web-based sales and getting 11 million customer comments on its website a year, it’s probably not an unreasonable expense. Expense aside, the service-as-a-service model also tells us how new and untested the social media analytics world is. The fact that companies need to spend $60K-$180K per year to extract “actionable data” from their social media interactions in a largely service-based model says it all. Contrast this expert service model with the trend in the well-established data warehouse market away from its service model – where service is something delivered, often grudgingly, from harried IT departments– towards do-it-yourself, pre-packed, consultant-in-a-box analysis. The reasons there have been a growing backlash against the dependency-driven data warehouse model are not just because IT and business are – once again – not seeing eye to eye. Marketing teams – ironically the same teams targeted by SAS Social Media Analysis – are trying escape from IT-dependency because they have begun to master the complexities of data analysis and are chomping at the bit to use a new generation of tools to roll their own analyses, on their own time. The main gating factor is no longer data and technological complexity – many of the marketers and brand managers and analysts I talk to know what they are looking for. Rather, time to analysis is key, and IT’s reluctance or inability to provide timely analysis means they just need to get out of the way. Not so in the nascent social media world. SAS is sending in the consultants precisely because the correlation between social media activity and the need to take action – or even begin to know what action to take – is still not well-established. Those same marketer who know how to crunch the traditional data sitting in their data warehouses need a lot of help figuring out what to do about all that new “stuff” heading their way in the plethora of social media outlets they are trying to track. All this means that it’s clear that social media analytics will need to evolve towards this same disintermediation between consulting and the analysts, between do-it-for-me and do-it-yourself. This is the challenge to market: learn from what SAS and other market leaders are doing, and then put the analytics genii back in the box where it belongs. Social media’s newness tends to allow its proponents to segment it in its own marvelously new category, but the reality of the analytical task is that social media will quickly evolve to be a channel like every other, and its value will begin to normalize to be more a factor of its relative impact on commerce than its hype-driven newness now indicates. Whereupon being able to analyze social media interactions out-of-the-box will need to become as de rigeur as all those other analytical tasks that are migrating out of the hands of IT and into the hands of the business user/analyst. Exactly where it belongs. Industry Analyst, Consultant and author, former programmer, systems analyst with 25 years experience. Spent three years in Europe as an industry analyst and as Correspondent for Information Week and other industry publications. Regularly consults with leading public and private enterprise software, database, and infrastructure companies. An award-winning columnist for leading IT and business magazines, Josh is widely quoted in the trade and business press and he blogs at Enterprise Matters. Great post! It was extremely exciting to watch the SAS announcement. The world’s largest, private software company had validated the value of SMA and changed the SMA market forever. While the SAS announcement shows SMA is becoming mainstream, it is not as new as many suggest. Infegy’s Social Radar platform has been around for 3 years, providing enterprise clients with an on-demand SMA platform. Advertising, PR, and marketing firms are very sophisticated consumers of SMA solutions. SAS’s solution is years behind the competition and their demonstration highlighted some very significant weaknesses. Their natural language processing algorithm is very underpowered, thus the massive amount of neutral sentiment present in the results (social content is many things, but it is not indecisive). SAS is likely finding the analysis of numbers to be much easier than analysis of the written word. Personally, I feel sorry for any user subjected to SAS’s user interface. Compared to the other enterprise SMA solutions, SAS absolutely takes the crown in one key area – it is by far the least user-friendly option available. While the other players utilize the Web itself to inspire our design, SAS seems to have used a spreadsheet and an old IBM control panel to guide their design process. SAS’s $50,000 “installation fee” is an absolute mystery to myself and many others. The Web is infinitely dynamic – the second SAS completes the effort, their work will be obsolete. We’ll gladly work with SAS customers to get them up and running on the Social Radar SaaS SMA platform while providing more accurate analytics, better usability, more functionality and unrestricted flexibility ALL at lower cost. SAS customers can be leveraging Social Radar on-demand before the SAS team even gets started. Fundamentally SMA is a disruptive technology and will change the way companies interact with the marketplace forever and, thankfully, change it for the better. Companies will continue to be more aware than ever thought possible. Social media is not just a new channel – it is THE channel. Gone are the days of stuffing a coupon in every American mailbox and of TV commercials yelling at all of us to find one of us. Consumer testing? You don’t need to test – you can simply ask. Ask them as many questions as you want – they’re answering them either way. What features do our customers like the most? Ask them. What new feature do they want the most? Ask them. Which marketing campaigns are working? Ask them again. What do customers like about our competition? Ask anything you can think of. Stop guessing, just ask. We all want companies to listen and learn from what we’re thinking; this ability leads to more valuable interactions for everyone involved. Having one of the world’s best software companies throw their hat in the SMA ring, even if it was a top hat, is incredibly exciting. Thank you for the great post Josh! I agree the SMA market is just getting warmed up.